Three out of four isn’t too shabby. New orders for durable goods fell last month, the first decline in the last four months. Even if we maintain that success ratio, rebuilding the business of durable goods manufacturing is going to take time. Therein lies the symbolic challenge for the broad economy. Recovery is underway, but it’s still unclear if it’s sustainable at a sufficiently high pace to make a dent in the damage of the past two years. In any case, we’ve still got a long way to go. Then again, it’s pointless to look at absolute dollar levels from the old peaks. New orders for durable goods, for instance, were routinely running in the low $200 billion range every month before the Great Recession hit. Now we’re still struggling to reach $180 billion. But it’s the strength of the trend that matters now. 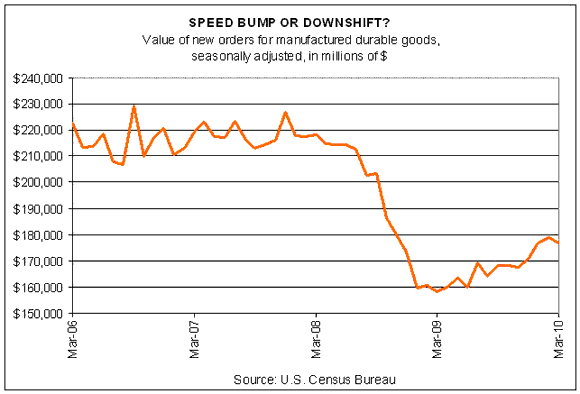 If we ignore the volatile transportation sector, new durable goods orders rose a strong 2.8% last month. Of course, if we leave off defense-related business (i.e., Uncle Sam’s orders), we’re down by 1.2% in March. No matter; if we look at the various sectors that make up the full mix of durable goods orders there are gains and losses to consider. Overall, there’s economic bubbling in the country, and some of it’s showing up in the cyclically sensitive corner of durable goods. New orders for machinery and computers/electronics, for instance, boasted tidy gains in March. The fact that orders overall slipped in March isn’t suprising after the near-7% rise over the three months through February. Durable goods orders are a volatile lot in the short term. It’s the long run trend that’s crucial. On that front, the news remains encouraging. Durable goods have bounced higher by around 10% from the recession lows of a year ago. A similar story describes recent history for a number of other key economic metrics. We can see the positive change in a number of broad economic gauges. The Aruoba-Diebold-Scotti business conditions index published by the Philadelphia Federal Reserve, for instance, shows a dramatic surge over the past year. We remain concerned that global growth will slow over the course of 2010. Inventory restocking and continued stimulus suggest many countries will report stronger growth in H1 2010, but as these factors wane and aggressive job growth fails to materialize, growth in many advanced economies–starting with the U.S.–is expected to decelerate in the second half of 2010. Private investment and consumption will struggle to post strong gains after the effects of stimulus policies start fading. The end of destocking has propped up growth, particularly in Asia, but there are already signs that the growth momentum has slowed, particularly in Europe. The effect of inventory restocking may fade out by the middle to latter part of 2010. No one knows if this risk will plant the seeds of something more than a speed bump on the road to recovery. But every time we see a dip in the economic report du jour in the months head, Roubini’s warning will come to mind. The forces of recovery seem likely to win, but it’s too soon to make definitive predictions.